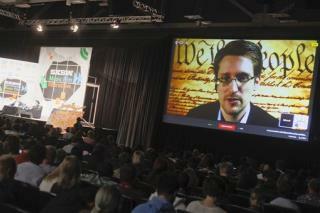 (Newser) – By leaking NSA data, Edward Snowden forced himself into exile—but he'd "absolutely" do it again, he said today during a video talk broadcast at SXSW. He spoke from Russia, saying that he "took an oath to support and defend the Constitution," NPR reports. "I saw the Constitution ... being violated on a massive scale," he continued. And for what? He argued that the US has "actually had tremendous intelligence failures because we're monitoring ... everybody's communications, instead of the suspects' communications." He pointed to the Boston Marathon bombings as an example, arguing that tips about the terrorists may have been overlooked while investigators focused on the surveillance programs. "Took an oath to support and defend the Constitution"? Bullcrap. He did this for fame and notoriety, to escape obscurity (which is the fantasy of most). He seized an opportunity. Just because you see something you think might be wrong, that doesn't allow you to commit a crime yourself, even if you think it's to correct a perceived problem. Example: If you think somebody you've identified a person who once robbed your house, you are not permitted to go to his house and shoot him. Is he proud of the legacy of Kim Philby? Guy Burgess? Donald MacLean? Ofcourse he would do it again. He never faced punishment for the first time. Smart Children learn not to stick their fingers in the pretty fire if they get burned the first time.